Piedmont Health System, Meadows Regional Health System, Effingham Health System, and Colquitt County Schools are among those honored. 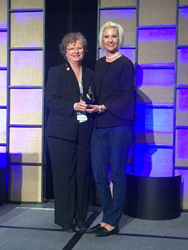 Susan McLendon of Meadows Regional Health System accepts the Telehealth Leader Award from Keri Brantley, Conference Director at GPT. The conference is a great opportunity to honor those in our network who are true telehealth champions. Georgia-based telehealth networking agency Global Partnership for Telehealth recently honored four partners with awards at its 9th Annual Conference in Jekyll Island, GA. The organization gave Piedmont Health System in Atlanta the Award for Excellence in Telehealth and honored Susan McLendon, with Meadows Regional Health System in Vidalia, with the Telehealth Leadership Award. Furthermore, GPT named Joe Tallent, Telehealth Coordinator at Effingham Health System, its Telehealth Coordinator of the Year and honored the Packer Health Clinic, based in the Colquitt County School System, as its School-Based Telehealth Program of the Year. Close to 150 registrants watched as Global Partnership for Telehealth distributed the awards on Wednesday, March 21st to close out the conference at the Jekyll Island Convention Center. Brantley said that honoring the award-winning telehealth practices and coordinators was an excellent way to close out a very successful conference. Global/Georgia Partnership for Telehealth (GPT) is a nonprofit corporation whose mission is to deliver worldwide access to healthcare by leveraging technology. With a 12-year track record of success developing and implementing sustainable, cost-effective telehealth programs, GPT is the leading nonprofit agency globally focused on increasing access to healthcare through innovative use of technology. Currently, GPT manages a network of more than 650 endpoints, including partner providers, health systems, schools, universities, long-term care facilities, correctional facilities, and international mission projects. For more information, visit GPT's website at http://www.gatelehealth.org. If you would like more information about this topic, please contact Evan Pell at (912) 285-0902 or email at Evan.Pell@gpth.org. Global/Georgia Partnership for TeleHealth, Inc.